Social 5:00 p.m. Dinner 6:00 p.m.
2017 was an excellent year for the Raider Education Foundation. The board of directors continued to have monthly meetings that involved setting up for future events, electing officials, and discussing the best way to utilize the 101 donation money in the Mt. Ayr Community School District. David Greene continued to serve as the president, Jill Weehler continued to serve as the vice president, and Jodie Geist remained at her position as treasurer and secretary. The remaining board of directors included Barbie Belzer, Brandi Shay, Brad Elliott, David McNeill, Erin Budach, Karen Bender, Jill Ehlen, Joan Jackson, Martha Landphair, Tess Rinehart, and Tracy Giles. The Foundation is very proud to host several events, award college scholarships, and provide funding for teachers' classrooms. The foundation hosted the quilt fest, the 2017 Hall of Fame Banquet, Foundation Night, an intern program and two 101 Donations Events. For 13 years, the Mt. Ayr Community School endowment sat stagnate with a balance around $13,000. In July 2013. An interested alumni group formed, met with the director of the South Central Iowa Community Foundation and from there the Mt. Ayr Community Schools Foundation board was created. The focus was to grow the Mt. Ayr Community School Endowment. Since then, the endowment has grown to more than $96,000. In 2016, the focus and name changed to the Mt. Ayr Raider Education Foundation and became a 501c3 entity. Fast forward four years later, 2017 was one of the best years to date for the Foundation. To date, the Mt. 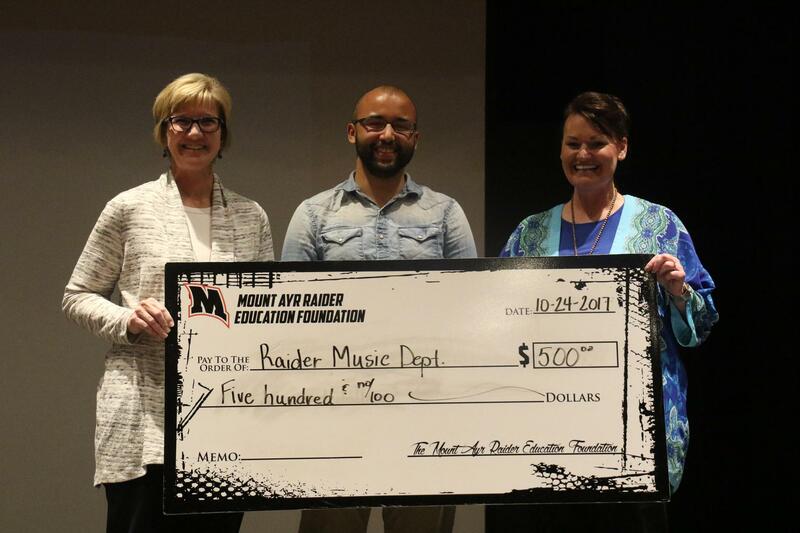 Ayr Raider Education Foundation has gifted over $10,000 to teachers and students of Mt. Ayr Community Schools. We hope that 2018 will bring more members and opportunities for the staff and students at Mt. Ayr Community School District. Here are pictures of our latest 101 Donations recipients. 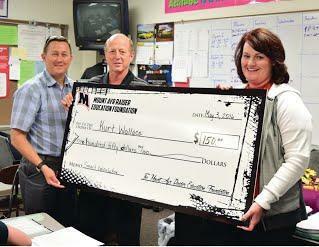 Scott Giles received $1000 for the purchase of a heating oven for his Industrial Tech program. 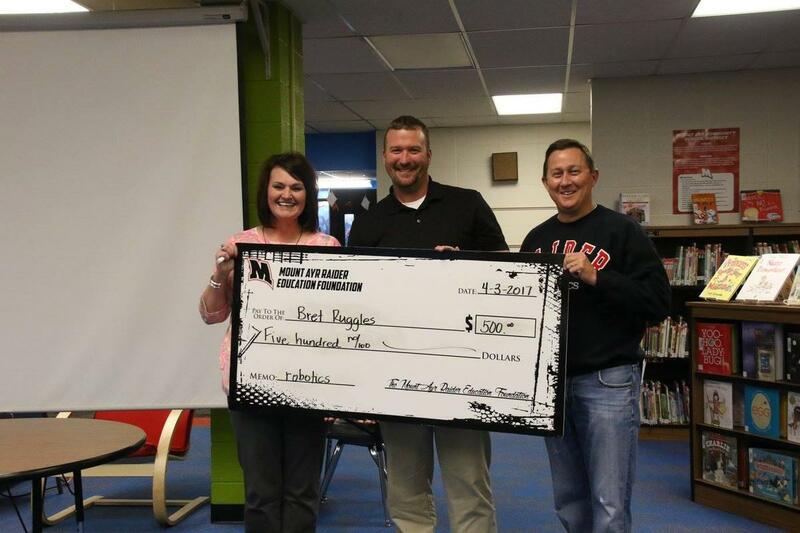 Melissa Shields received $500 for equipment in her Special Education classroom. Aaron Riley received $500 for supplies for his Art Department. Our latest 101 Donations Recipient is Shaun Kniep! She received funds for purchasing new books for her curriculum. Our annual fundraising night will be this Friday, January 26! We will start the evening with a spaghetti supper at 5:00. The meal will include spaghetti, green beans, salad, hot rolls, dessert and a bottle of water for $6. Throughout the evening there will be Silent Auction items to bid on. We have lawn care services, a load of rock, delicious pies and bread, a metal sign from the Metals class and a Raider football jersey autographed by Ezekiel Elliott! There are other items as well and they are all advertised on the Facebook page for the Foundation. This should be a fantastic night to raise some money and reconnect with current members while increasing our list of members to some new faces. If you have not signed up for the 2018 101 Donations Club, please do! We appreciate your help in providing funds to make our District even better! The 101 Donations presented 3 lucky groups last night(Oct. 24, 2017) with funds for their programs. Thank You 101 Donations Sponsors! Katie Coulson presented for the Kindergarten classes. 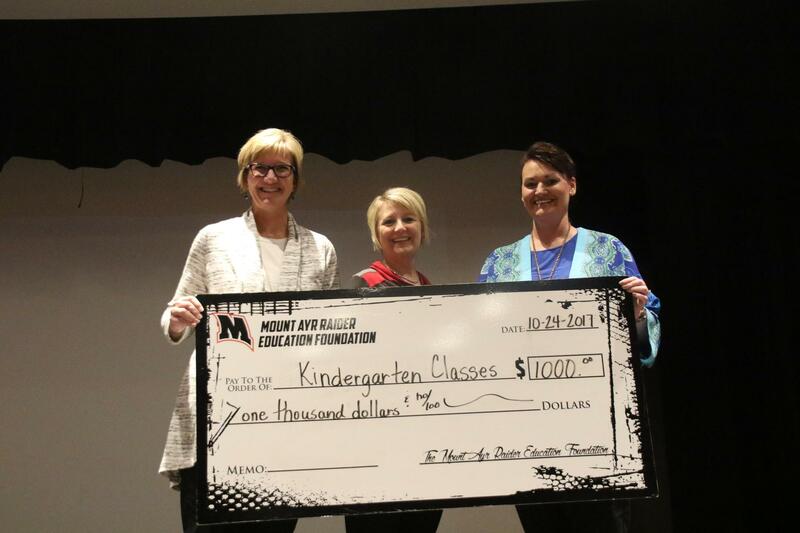 They received $1000 to help fill their morning work tubs with manipulatives for learning. Collin Zidlicky presented for the MS and HS Band classes. They received $500 to purchase new band pieces from various cultures. Tara Rush presented for the SFL program. They received $500 to purchase STEM activities to help with after school programming. The Hall of Fame Banquet will be before your know it-don't miss out! Here is the flyer with details for the evening. Please PRINT the names of the people who will be using the tickets. Also note any special dietary considerations. We will accommodate your dietary needs to the best of our ability. Please contact Jodie Geist at 641-464-2480 with any questions. We have had another amazing night of listening to and granting gifts for programs to benefit students from the Mount Ayr Community Schools! Thank you to our 3 presenters: Chris Elwood, Abby Elliott and Bret Ruggles. Thank you to those that could attend! Thank you to those that viewed us online! Thank you to those that emailed in your vote! It was a complete success and our donations 100% back to the school currently balance at just over $9000! *If there is someone NOT on this list that you think would be a perfect candidate to join our cause, please contact us and we will do the necessary work to reach out to them. please send it in as soon as possible. We are now accepting re-enrollments and new members! If you know of someone we should reach out to that is a great candidate for our organization, please contact us and we will send them the necessary correspondence. It is time for the Mt Ayr Raider Education Foundation Night! We will be hosting our annual Foundation Night on Friday, January 27 in the High School Commons. The basketball game that evening is with Southeast Warren. We will begin with a spaghetti supper at 5:00. There will be spaghetti, lettuce salad, green beans, hot rolls and desserts all for $6. During the games we will be having a Silent Auction showcasing local bakers! You do not want to miss out on the opportunity to take home one of the prized foods! We will also have plenty of registration forms to sign up and join our program. Pass the word to your family and friends! And last but not least.....there may be some surprise giveaways! The Mt. 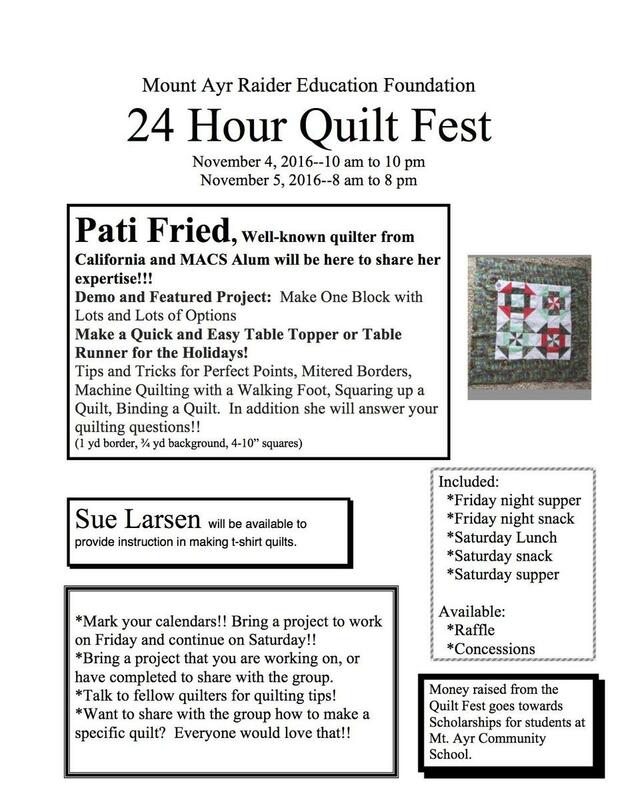 Ayr Raider Education is once again sponsoring the Quilt Fest at the Mt. Ayr Community High School. The money raised from this event goes towards scholarships for Mt. Ayr graduates. On Friday, September 23 the 101 Donation Club was at it again. 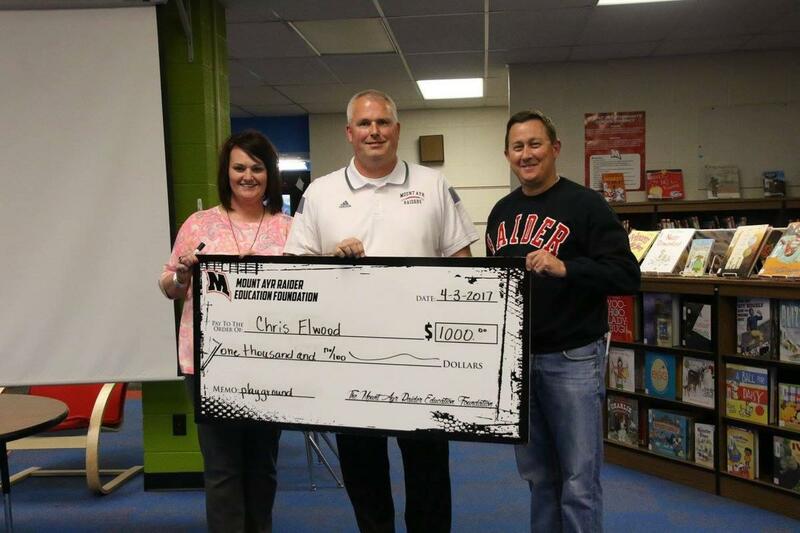 The group surprised Mr. Chris Elwood and the Elementary School with a donation check. The money will be used for earphones for each classroom and $500 to be put to use in the funding for a new playground. Along with surprising a few teachers with special gifts this Fall the 101 Donations Club partnered with Shopko and surprised the entire Elementary student group with 1 free box of Crayola Markers. Below is a picture of the Kindergarten classes showing off their new markers! Thank you Shopko for helping us out! Reservations required. $35 each or buy a table for $240. (The table must be paid for with one check.) Reservations due by September 28. More Surprises by the 101 Donations Club! When Mrs. Darla Sobotka, third grade teacher, walked into her classroom Friday morning she was met with quite a surprise! Thanks to the generous donations of our community she and her class were provided with a large supply of books, games and puzzles. You can see by the smiles on their faces, they are very appreciative to the Mt. 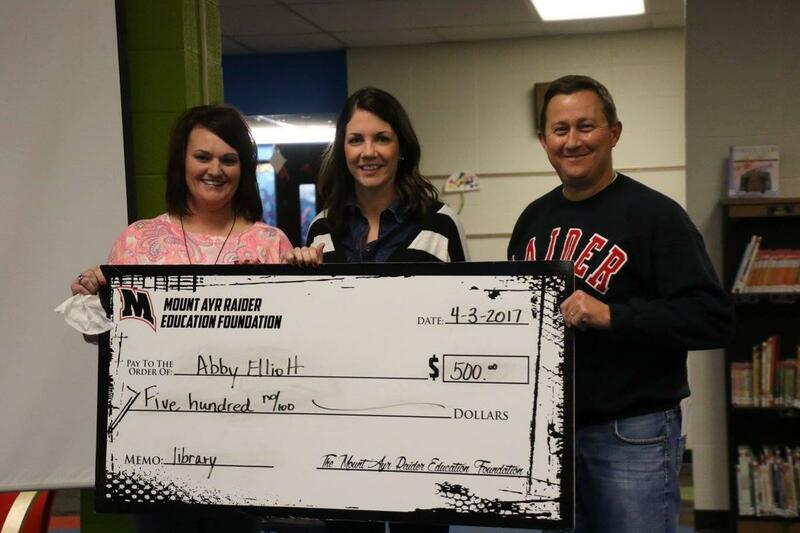 Ayr Raider Education Foundation in helping fulfill her grant wish. We thank our community once again for helping to make this possible. A surprise "May Day Basket"was given to Mr. John Larsen and Mr. Kurt Wallace for TI-84 Smartview Emulator Software. This computer software allows Mr. Larsen and Mr. Wallace to demonstrate to students how to use their graphing calculator to solve problems. 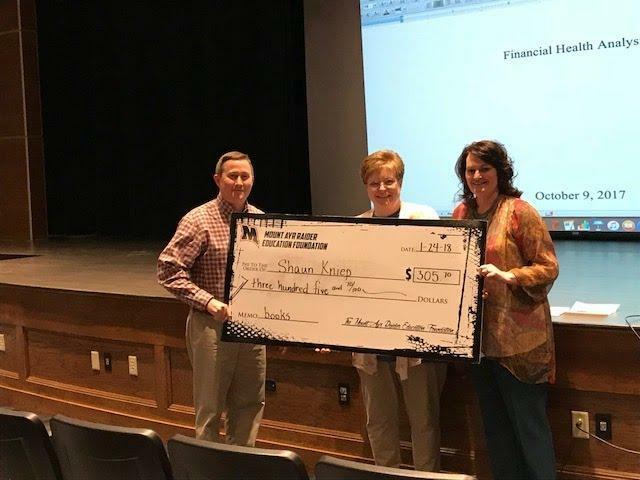 David Greene, Kurt Wallace and Jill Weehler with the presentation check! David Greene, John Larsen and Jill Weehler with the $150 check! Mrs. Bethany Knox's class exploring the new dramatic play center that Bethany purchased with her 101 Donation money. in the lives of these children! in the 101 Donations Club. 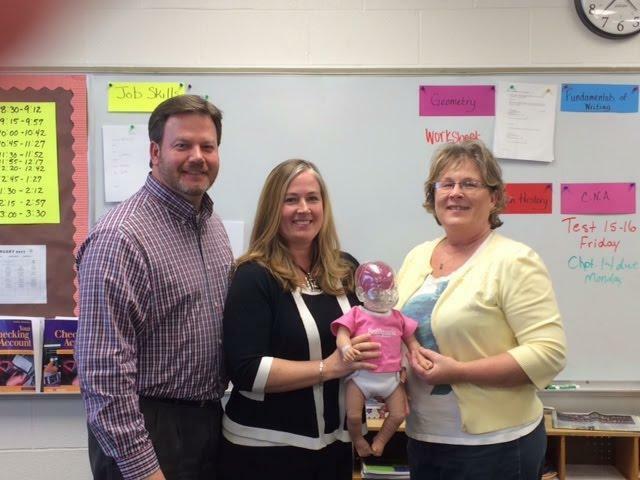 Last night we also surprised Darla Sobotka with kicking off a "spring cleaning" campaign. She requested board games for indoor recess and we have responded with asking people to donate new or slightly used board games to meet this need. If you would like to donate to this project, please contact the Foundation at foundation@mtayrschools.org. It's not too late to join the 101 Donations Club! We will be hosting our first ever 101 Donations Club Night on Monday, April 4. Plan to attend, even if you are not a member yet. We will always welcome new faces to our group! The evening will being at 5:30 with a Social time where we can visit and enjoy snacks and drinks. It will be held at the Elementary Library. Enter through the South Main doors of the building and we will guide you in if you are not familiar with the set-up. We have chosen 3 wonderful candidates that you will select from to receive monetary gifts for their programs. There will be a $1,000 winner and 2 $500 winners. It will be a fun evening for all! 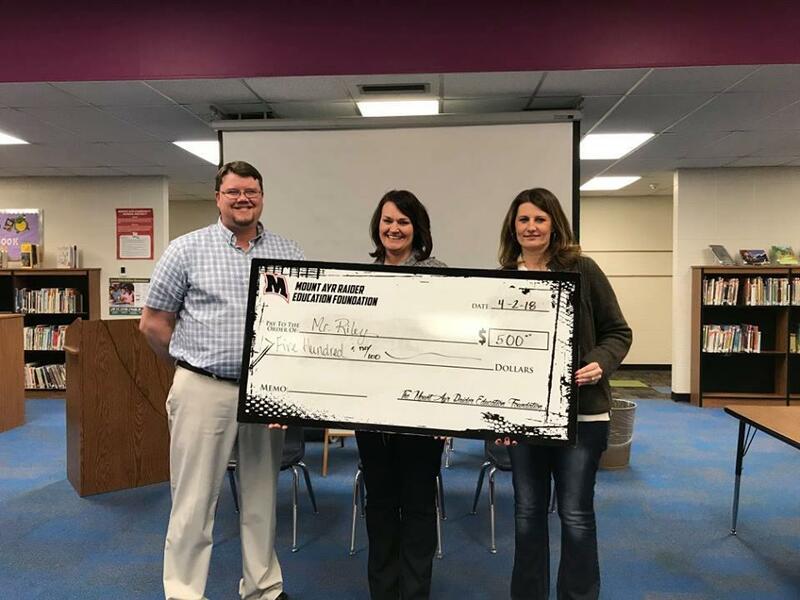 Mount Ayr Community School Foundation Receives Additional $3000 Match! 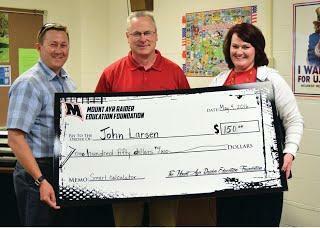 In an effort to help the Mount Ayr Community School Foundation Endowment raise their $1 for $1 $8000 match grant from South Central Iowa Community Foundation by the May 1, 2016, Dan and Joe Cunning are offering an additional $1 for $1 match for the next $3000 donated to the Mount Ayr Community School Foundation. Two thousand dollars have already been raised. If $3000 is donated by alumni, individuals, businesses and organizations before May 1, 2016, it will be matched by the Cunnings, reaching the $8000 goal and resulting in an additional $1 for $1 match by South Central Iowa Community Foundation. The Mount Ayr Community School Foundation exists to help ensure the highest quality education for all students for generations to come. 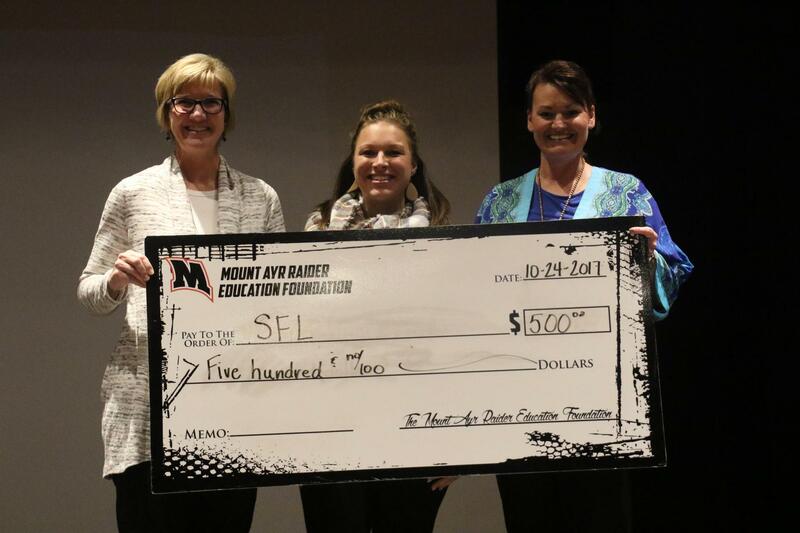 If you would like to help Mount Ayr Community Schools for perpetuity and have your donation matched twice; send your tax deductible donation to South Central Iowa Community Foundation (SCICF), 108 North Grand, Chariton, Iowa, 50049. 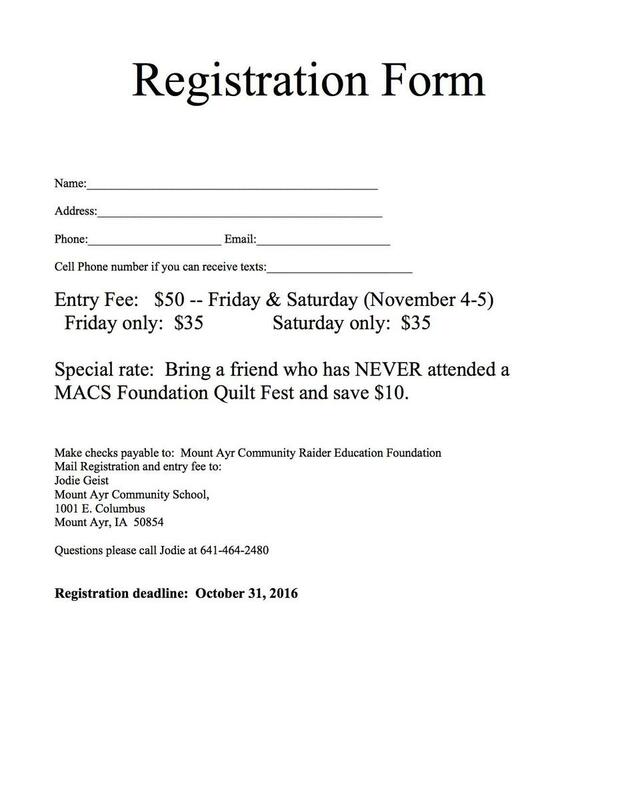 Make your check payable to SCICF/Mount Ayr School Foundation. Those serving on the Mount Ayr Raider Education Foundation Board who oversees and helps to grow the Mount Ayr Community School Foundation Endowment, helping to ensure a high quality education, include David Green, Jodie Geist, Molly Murphy, Jill Weehler, Barbie Belzer, Joan Jackson, David McNeil, Brad Elliott, Martha Landphair, Tracy Giles, Brandi Shay and Ronnie Landphair. For more information contact a committee member, call SCICF at 641-217-9105, visit www. http://www.mtayrschools.org/macs-foundation www.scicf.org. 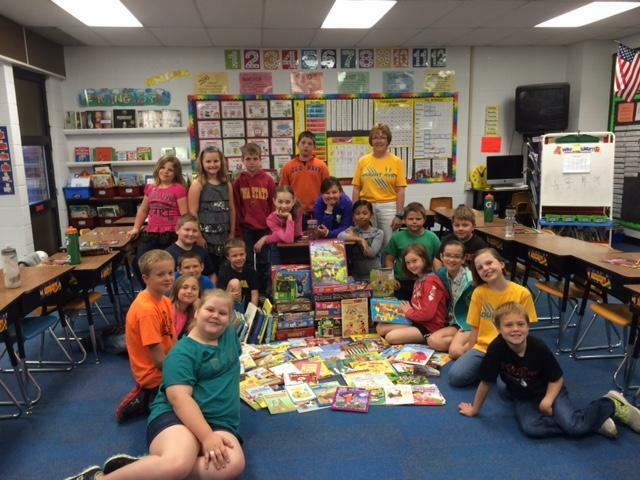 or follow the Foundations activities on Facebook: Mount Ayr Community School Foundation. Click below to view Quarterly Newsletter. The 2nd Annual Mt. Ayr Raider Education Foundation fund raising supper was held on Friday, February 5, 2016. There was a great turnout and new monies were raised for our group. The evening included a delicious meal served by Alumni. The meal included spaghetti, green beans, hot rolls and dessert bars. At halftime Jill Weehler and David Greene spoke about our new 101 Donations Club and kicked off this fund raising venture. Jody Greene’s Fourth Grade class then won a beanbag game. This was funded by the organization through a grant process Mrs. Greene had applied for. A unique part of the evening included alumni visiting the information table and wearing designated buttons for their graduating school. It was neat seeing how many of our schools were represented. 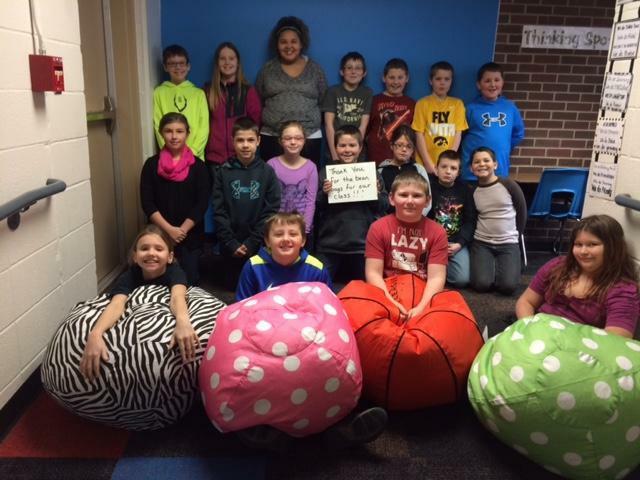 Mrs. Greene's Fourth Graders with their new beanbags-love those smiles! Come Join the 101 Donations Club!!! 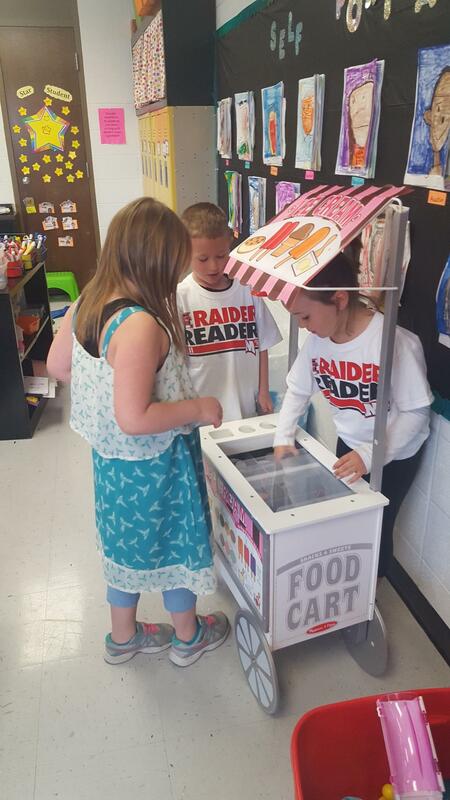 The Mount Ayr Raider Education Foundation is excited to announce the 101 Donation Club! The purpose of the club is to raise at least $10,000 each year to fund educational opportunities at the school. Members of this new club will each contribute $50 two times a year, for a total annual donation of $100. They will then have the opportunity to join our bi-annual events to learn more about current projects and vote for the opportunity they would like to see funded. Scholarships, field trips and educational tools for classrooms are examples of some of the needs that could be realized by generous donations from the Club. We need a minimum of 100 members to kick start this innovative initiative. We invite you to be an inaugural member of the club! Our first charter meeting will be held in early April of this year. Contact Jill Taylor Weehler at weehler@mtayrschools.org for more information. 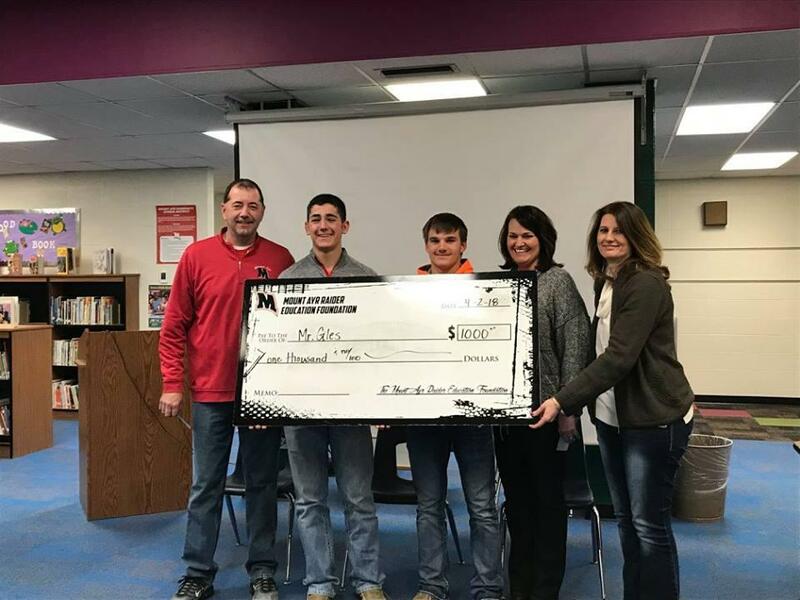 The MACS Foundation has received a $8,000 matching grant from the South Central Iowa Community Foundation to assist in our fundraising efforts. To date, we have raised $1600 towards our match. The deadline for matching $8,000 is May 1, 2016. If you would like to make a monetary donation to the Mt Ayr Community School Foundation please send your check to Mount Ayr Community School, 1001 E. Columbus St. Mt. Ayr, IA 50854 c/o Jodie Geist or South Central Iowa Community Foundation, 108 North Grand, Chariton, IA 50049. On the memo line, please write MACS Foundation. 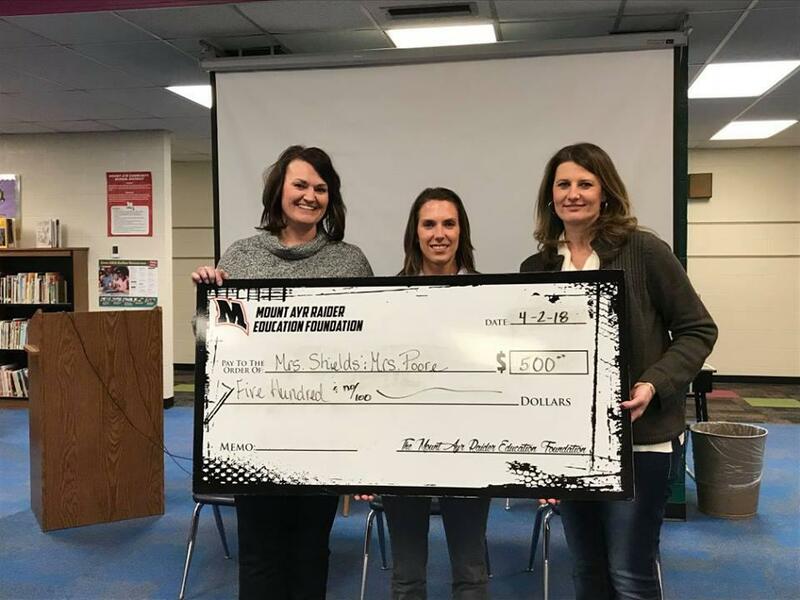 Thank you in advance for helping the Foundation in their fundraising efforts for the students of Mount Ayr Community School. 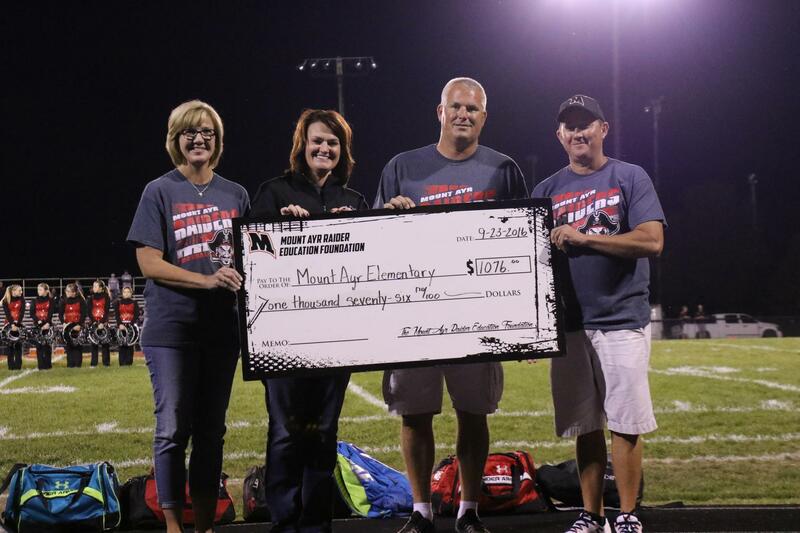 Mount Ayr Community School Foundation. Thank you Darla Sobotka for taking the pictures!! Thank you to Derek Lambert for the video. The Foundation is gathering MACS Alumni information and would appreciate your contact information please click here to enter your information.